by James Martin, S. J. After my son came out as transgender and I began referring to her as my daughter, I've been approached by several friends telling me that their own child is transgender, lesbian, gay, or bisexual. Most of those friends also attend my church. 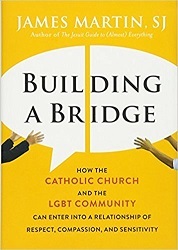 To all of those friends, I'm going to start recommending this little book, with its focus on letting LGBT folks know that Jesus loves and accepts them.